Yuengling – Oldest (Craft) Brewery in the US? Hands-down, Yuengling Brewery is the oldest American brewery and in 2009 it celebrated its 180th birthday. Two locations brew the beer and also feature tours: Pottsville PA and Tampa FL. When prohibition took over the US, Yuengling and Son Brewers shut down their alcoholic beverage line and concentrated on a dairy farm, and an almost beer (0.5%). While the extent of their brewing does not include a range of brewing styles, they do feature their traditional Yuengling Lager, a Yuengling Light (98 calories) and Yuengling Light Lager (99 calories), a Premium (pilsner) beer, a Dark Brewed Porter, Chesterfield Ale (originating in 1829), Black and Tan (made of Dark Brewed Porter mixed with the Premium). More variety than your run of the mill Coors or Miller! Without knowing the strict definition, I wondered (based on my assumption that Craft or Micro was defined as 1. small production; 2. variety of “specialty” (i.e., non-watery) brews; and 3. intention to be part of the craft industry) — would Yuengling qualify to be called a “craft brewery” (they do some non-traditional brews) or is it eliminated based on the volume of their production line (Yuengling.com quotes that they use over 300,000 gallons of water a day is used at the PA plant which implies a high volume of production)? “The Brewers Association created the definition of what a craft brewer is so the organization could provide statistics on a growing beer industry segment consisting of the majority of the breweries in the US. I don’t know the “official answer” but I suspect that is Yuengling qualifies today (I think they produce too much!) it will soon surpass the production limit. 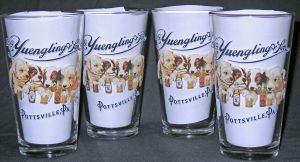 Today, with improved brewing methods, tried and true recipes, a penchant for variety, coupled the good marketing and adorable puppy glasses (fashioned after their 1907 calendar lithograph called “A good story”), Yuengling has established itself not only as THE oldest brewery in the US, but also as an upcoming (specialty) brewery of note. While Yuengling is not yet available west of the Mississippi, there are expansion plans for the company. Onwards and upwards Yuengling! Have a good (tasting) weekend!